The spaceship, VSS Unity, has successfully completed its first free flight! The important test flight marks the first time that a vehicle built by our sister organization, The Spaceship Company, has flown fully under its own control. VSS Unity was piloted by Mark Stucky and Dave Mackay, with pilots Mike Masucci and Todd Ericsson as well as flight test engineer Dustin Mosher in WhiteKnightTwo. Over the course of the 1 hour 20 minute flight-particularly the 10 minutes of free flight for SpaceShipTwo-our pilots, mission controllers, and ground crew collected valuable data. The test flight was the fifth flight of VSS Unity (and the 218th flight of WhiteKnightTwo), following several recent Captive Carry flights. As referenced earlier, this glide flight was the first of many. We have not yet reached the rocket powered phase of the test flight program-first we need to gather test flight data to confirm our analyses and calculations about how VSS Unity will perform in a wide variety of real-world flight conditions. As expected, for this first gliding test flight, VSS Unity was flying light and slow, achieving a maximum speed of approximately Mach 0.6 while gliding home from an altitude of 50,000 feet. An initial look at the data as well as feedback from our two pilots indicate that today's flight went extremely well, but we'll take the time to properly and thoroughly analyze the vehicle's performance before clearing the vehicle for our next test. 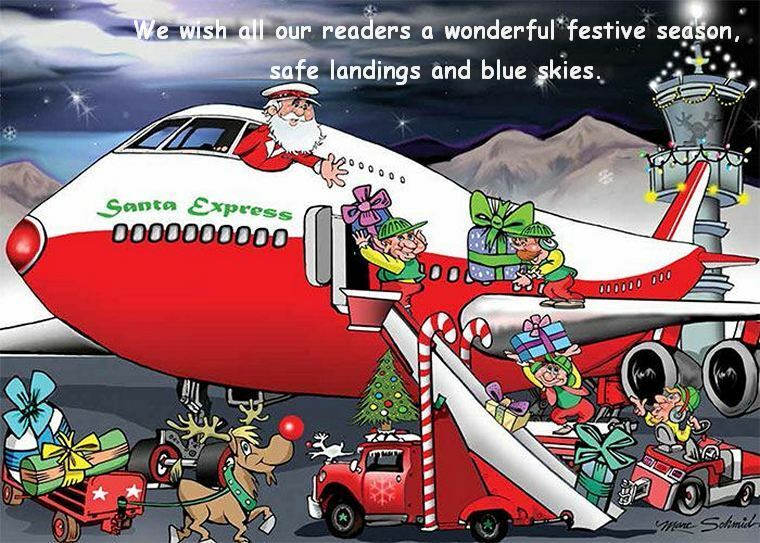 We're looking forward to getting back into the skies as soon as the engineers say we are ready to do so. On 2nd December, the Ambassador of Belgium, HE Hubert Cooreman, visited the premises of the Airplane Factory (TAF), located at the Tedderfield airpark in Eikenhof, south of Johannesburg. He was accompanied by Jean-Pierre Muller, head of Awex Johannesburg, Claudine Vandenabeele, Trade & Investment Advisor at Awex, and three representatives of the DTI (Department of Trade & Industry). 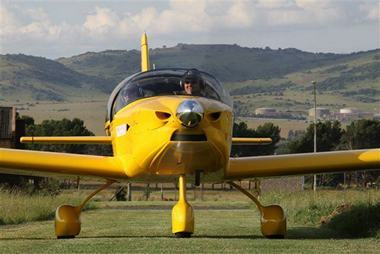 TAF's unique business was started in 2006 by the South African micro-light pioneer and aviation passionate, Mike Blyth. 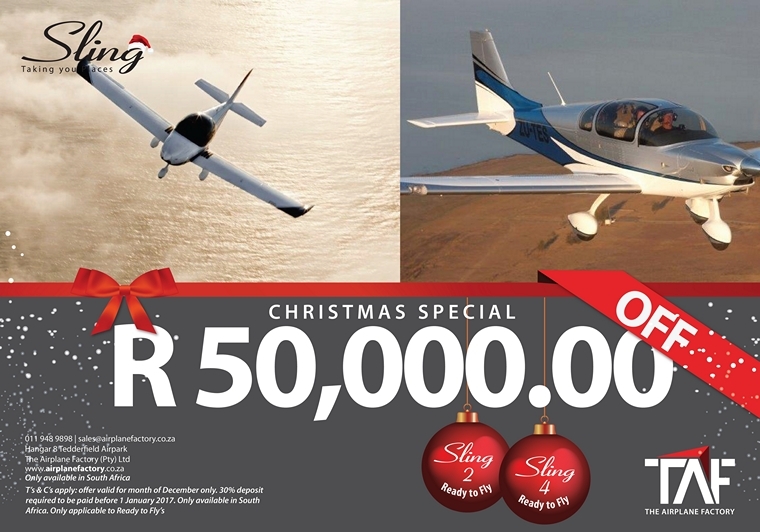 The company designs, produces and assembles 2 models of small aircrafts, the Sling 2 and Sling 4. These aircrafts are categorised as light sport aircraft (LSA), are not certified and therefore sold to amateurs around the world. It is a 100% South African product, made with aluminium from Germany, an engine from Austria and expertise from their own laboratory. Since being operational, TAF has sold about 300 models, as far as New Zealand, South America and the United States. In 2015 TAF was approached by the Belgian SONACA Group, an engineering company in aerospace based in Gosselies, Belgium that supplies major companies like Airbus, Bombardier, Dassault, Embraer and employs 2400 people worldwide…. 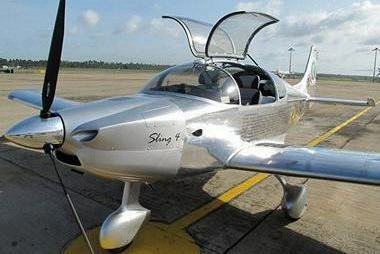 The 2 companies formed a Joint Venture, called Sonaca Aircraft, in which TAF holds 25%. The objective is to develop and sell a new plane called 'Sonaca 200' which will be a certified version of the Sling 2 model. All the parts will be produced in South Africa and the plane will be assembled in Gosselies. The certification and marketing of the Sonaca 200 will be handled by the Sonaca Group, which has got the financial backbone, a worldwide reputation and a solid network to promote it. The main market for this plane will be flying schools. The 1st planes should be ready and certified by mid 2017. As of today, the order book is already for 22 planes, which gives an idea of the commercial success and potential of this unique South African-Belgian product. Medium-term, this will imply at TAF that production capabilities as well as skilled employment will have to be doubled or tripled, a very positive development in a very competitive market. 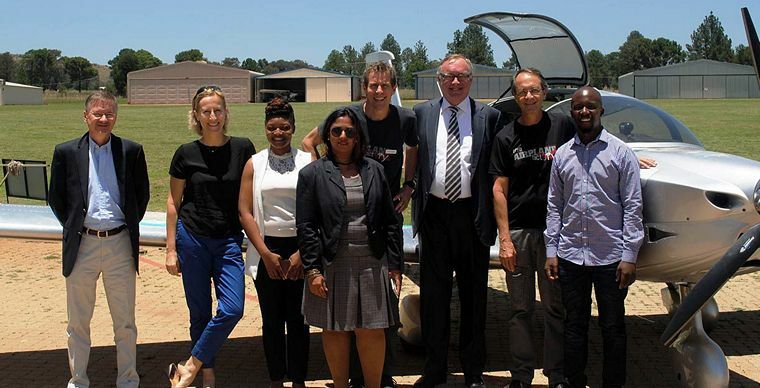 And this is made possible thanks to a Belgian investment and commercial interest in a South African technology! 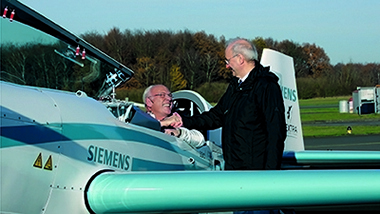 The Extra 330LE aerobatic aircraft powered by a drive system from Siemens set a new world record for time to climb. At the Dinslaken Schwarze Heide airfield in Germany, the electric-powered plane reached an altitude of 3,000 meters in just four minutes and 22 seconds - a climb velocity of 11.5 meters per second. The time set by pilot Walter Extra was 1 minute 10 seconds faster than the previous world record set by U.S. pilot William M. Yates in 2013. The world air sports federation, Fédération Aéronautique Internationale (FAI), has officially recognized the record flight in the category "Electric-powered planes less than 1,000 kilograms." 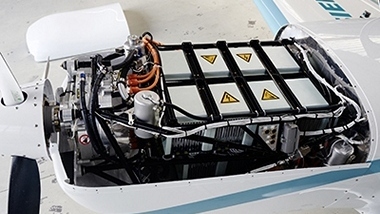 The new drive system from Siemens completed its first flight only in June 2016. The handy electric aircraft motor was already a world-record-holder for power-to-weight ratio even then. Weighing just 50 kilograms, it supplies a constant electric output of around 260 kilowatts, or five times as much as comparable drives. "This is another milestone on the path to the electrification of air travel," says Frank Anton, head of eAircraft in Siemens' venturing unit next47. "This amazing performance was possible only with digital technologies, which enabled us to optimize our drive train to its technical limit." The Extra 330LE, weighing around 1,000 kilograms, is the trial unit for the new drive - as an aerobatic plane it's perfectly suited to taking the components to their limits, and testing and refining. From March to September 2017, the Breitling DC-3 will be doing a grand world tour in several stages, an amazing accomplishment for this legendary plane that will be celebrating its 77th birthday. The crew will not be alone in flying from one continent to the other, since a 500-piece Navitimer limited edition will also be on-board throughout the journey. A privileged partner in the conquest of the skies, Breitling demonstrates its commitment to safeguarding the aeronautical heritage by supporting the restoration of legendary aircraft - such as the Lockheed Super Constellation and the Douglas DC-3. This twin-engine propeller plane launched in 1935 revolutionized air travel. Nicknamed the "Normandy landings plane", it enjoyed its moment of fame in June 1944. More than 16,000 were built and most major airlines acquired them as part of their fleet. 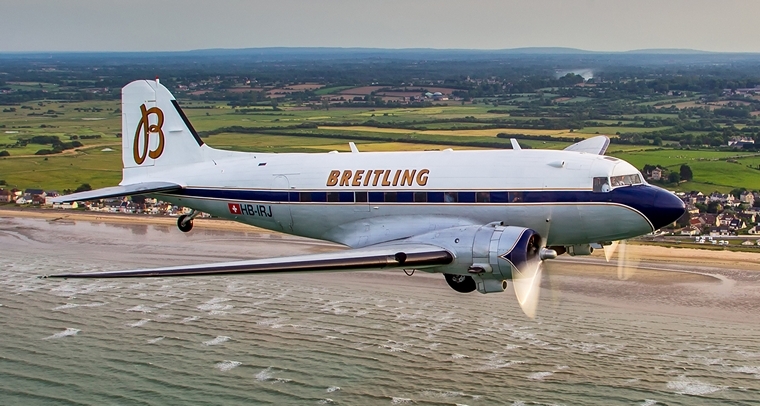 Today there are less than 150 DC-3 aircraft in flightworthy condition worldwide, including the Breitling DC-3. This DC-3 HB-IRJ was delivered to American Airlines in 1940 and first used by the American military between 1942 and 1944, before resuming service on behalf of various commercial airlines. Restored by a group of dedicated enthusiasts, it now flies under Breitling colors and participates in a variety of airshows. In 2017, Breitling will launch its DC-3 on a major round-the-world tour in several stages that will notably encompass the Middle East, India, South-East Asia, North America and Europe. This World Tour will begin and end in Switzerland, starting from Geneva in March and winding up in September at the Breitling Sion Airshow 2017. It will be punctuated by numerous stopovers providing opportunities to organize events and take part in air shows. Certain privileged passengers will be welcomed aboard for certain stretches. Breitling has also chosen to mark the event by introducing a 500-piece limited edition of its famous Navitimer aviation chronograph. This steel Navitimer 01 (46 mm), powered by Manufacture Breitling Caliber 01, will notably be distinguished by its caseback engraved with the Breitling DC-3 World Tour logo. Enthusiasts will however have to wait until the fall of 2017 to get their hands on this model, since the brand has decided to have it travel aboard the Breitling DC-3 around the planet, thus ensuring it is truly part of the entire adventure. Each watch will be delivered with a certificate signed by the flight captain. In launching this Breitling DC-3 World Tour, Breitling once again displays its determination to share its passion for aviation with a broad audience. See you in March 2017 for the great take-off. Sikorsky, a Lockheed Martin company (NYSE: LMT), has inaugurated a new Systems Integration Lab (SIL) to begin testing key systems for the Combat Rescue Helicopter (CRH), the new aircraft being built for the United States Air Force. The USAF program of record calls for 112 helicopters to replace the Air Force's aging HH-60G Pave Hawk helicopters, which perform critical combat search and rescue and personnel recovery operations for all U.S. military services. The SIL encompasses 2,500 square feet located within the company's main manufacturing facility in Stratford, Connecticut. The SIL complex includes four laboratories for testing avionics, electrical power, electronic flight controls and integrated vehicle diagnostics. Each subsystem will be evaluated independently before progressing to a fully integrated aircraft-representative test configuration. The $1.2 billion Engineering Manufacturing & Development contract includes development and integration of the next generation combat rescue helicopter and mission systems, including delivery of four HH-60W helicopters, as well as six aircrew and maintenance training devices and instructional courseware. The training devices run the spectrum from full motion simulators and full aircraft maintenance trainers, to discrete "part task training devices" for aircraft systems such as avionics, rescue hoist and landing gear. The flight simulators, including both a full flight simulator with motion and a non-motion flight training device, will be built to the highest levels of FAA standards and include the capability to link with other simulators on the Combat Air Forces Distributed Mission Operations network. The flight simulators will train full aircrew allowing pilots and special mission aviators to train together. Avionics desk top trainers will have an array of touch screens mimicking the "glass cockpit" and include the ability to learn aircraft systems troubleshooting. The integrated experience will closely resemble the actual aircraft and allow the pilot to fly simulated missions to evaluate qualitative performance, such as pilot workload, and have the actual "look and feel" of the aircraft. "This facility provides a simulated flight environment allowing us to test key subsystems individually and then fully integrated. This will identify any issues before advancing to test flight, and will help reduce the number of required flight test hours, resulting in time and cost savings for the customer," said Tim Healy, Sikorsky CRH program director. The Paradoxal is a commercial supersonic/hypersonic passenger aircraft concept capable of flying on a sub-orbital parabolic trajectory between distant parts of the globe within hours. It uses a Rotary Ramjet engine as the air-breathing engine and then converts to a rocket to reach a suborbital altitude. A line of counter flowing jets of air on the aircraft's leading edges reduces heat and drag during the ascent and re-entry phases of the flight. The Paradoxal would thus be able to fly from Los Angeles to Sydney in less than 3 hours (7,585 miles) and make a gracious suborbital parabolic incursion into space for a fascinating view of the stars and earth from space. The Paradoxal would to take off directly from any airfield using two Rim-Rotor Rotary Ramjet Engines (R4E). These turbines produce significant thrust in a single-stage by spinning ramjet thrusters at supersonic speeds (tip speeds up to Mach 3) held together by a carbon-fibre rim-rotor. The R4E engines have a high power-to-weight ratio and could be manufactured at relatively low production costs (similar to today's automotive turbochargers). Efficiencies are similar to piston engines and low pressure ratio gas turbines (20-30%). The air-breathing engines would provide enough power to lift off, climb to 60,000 feet, and reach Mach 3. At this point, the engine would turn into a rocket engine by injecting liquid oxygen (LOX) into the gas exhaust port that would continue pushing the Paradoxal at supersonic speeds up to an altitude of 40 miles, setting it on a parabolic sub-orbital trajectory towards its distant destination. In mid-flight, you would see earth's curvature and the plane's multiple onboard cameras would grant you access to video feed of the view along with the best pictures. You would even get to experience weightlessness for one brief minute before heading back towards earth. The experimental aircraft is still very much at concept phase. Japan, Okinawa: The United States military on Wednesday grounded its tilt-rotor MV-22 Osprey aircraft in Japan after Tokyo called for a halt to flights following a crash southwest of Okinawa Island, the first accident involving the aircraft in the Asian nation. The U.S.-operated Osprey ditched into the sea, injuring its crew of five after a hose connected to the aircraft broke during a refuelling exercise. The first Osprey crash in Japan could further delay plans to relocate some U.S. forces on the island and comes amid a surge in resentment over U.S. bases after an American civilian working for the military was arrested this year over the murder of a 20-year-old Japanese woman. USA, Kennedy International: Lufthansa Flight 441 bound for Germany was diverted to Kennedy International Airport. The flight was diverted after a bomb threat was called in to a Lufthansa office. Officials evacuated about 500 passengers when the flight landed at Kennedy International. The threat was being investigated by the Port Authority Police Department Emergency Services Unit and the New York Police Department Bomb Squad. New Zeeland, Wairoa: A Farmers Air pilot and his loader driver died after the topdressing plane they were in hit high-voltage power lines north of Wairoa. New Zealand Agricultural Aviation Association chairman Alan Beck says agricultural pilots are on edge after this week's fatal topdressing plane crash. Six weeks earlier, two men died after their Robinson R44 helicopter crashed when they were undertaking a survey flight in Northland's Glenbervie Forest. USA, Detroit: A McDonnell Douglas MD-88 Delta Air Lines flight slid into the grass as it was taxiing after landing at the Detroit Metro Airport. The flight landed and was turning from the runway onto the taxiway when it left the pavement, stopping in the snowy grass. None of the 65 passengers or five crew members was injured. Afghanistan, Kabul: A Boeing 737-46J of Safi Airways flight 4Q502 from Herat, was damaged in a hard landing accident on runway 29 at Kabul Airport, Afghanistan. The right hand main gear separated and the aircraft came to rest with the no.2 touching the runway. An evacuation was carried out on the left hand side of the aircraft. 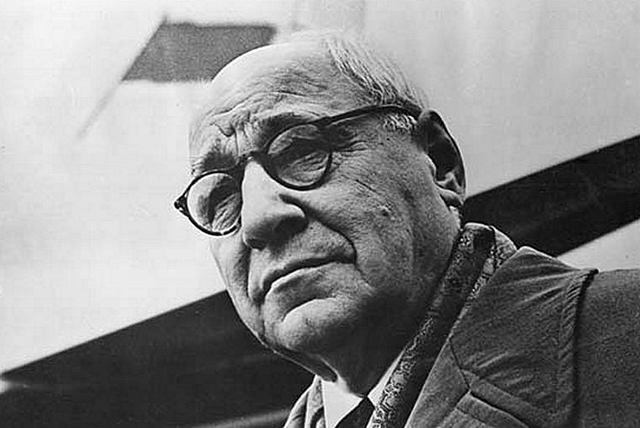 Andrei Nikolayevich Tupolev (10 November 1888 - 23 December 1972) was a pioneering Soviet aircraft designer. During his career, he designed and oversaw the design of more than 100 types of aircraft, some of which set 78 world records. In recognition of his work, he was made an honorary member of Britain's Royal Aeronautical Society and the American Institute of Aeronautics and Astronautics. However, in his native Russia he was twice arrested, once in 1911 for allegedly taking part in revolutionary activities and again on 21 October 1937 on trumped up charges of sabotage, espionage and of aiding the Russian Fascist Party. He was first honoured in his own country when he was declared Hero of Socialist Labour in 1945, an honour that was again bestowed on him in 1957 and 1972. In 1953 he was made an Academician of the Russian Academy of Sciences and in 1968 promoted to Colonel-General. In 1909, Tupolev began studying aerodynamics under the Russian aviation pioneer N.E. Zhukovski at the Imperial Moscow Technical School (IMTU). During this time he built one of the world's first wind tunnels which led to the formation of an aerodynamic laboratory at IMTU. In 1911, due to his arrest, he forced to leave and was only allowed to return in 1914. Tupolev completed his studies in 1918 with an Engineer-Mechanic degree awarded on the strength of his thesis on the development of seaplanes. After a spell of teaching at a course there on the basics of aerodynamic calculations at the Moscow Higher Technical School (MVTU) he joined the Central Design Office (TsKB) of the Moscow-based Central Aero and Hydrodynamics. The TsKB based there bombers and some airliners on the the all-metal aircraft design concepts pioneered by Hugo Junkers. In 1925, Tupolev designed the TB-1, a twin-engine bomber that was considered one of the most advanced designs of the time. By 1934, Tupolev under Tupolev's leadership the TsKB had become synonymous with the design and production of the 63-meter wingspan, eight-engine Maksim Gorki, the largest aircraft flying in the world at the time. Leaving the TsKB Tupolev set up his own bureau, producing a number of designs designated with the prefix ANT (Russian: ???) from his initials. However the bureau was raided. Tupolev was arrested and many of his colleagues were executed. Tupolev was tried and convicted on the trumped up charges in 1940 and sentenced to ten year imprisonment. Whilst in prison he developed the Tupolev Tu-2. He was released in July 1941 "to conduct important defence work." Tupolev headed the major project of reverse engineering the American Boeing B-29 strategic bomber, which was the world's first nuclear delivery platform. Using three machines which landed in Siberia after bombing Japan in 1945, Tupolev succeeded in replicating them down to trivial detail. Moreover, he got it into volume production, with crews fully trained in time for the 1947 May Day parade. The copy was designated Tu-4, with many subsequent Tu aircraft having the number 4 in their designations. Despite all his successes he was not "rehabilitated fully" until two years after Joseph Stalin's death in 1953.